The Regal Angelfish is undoubtedly one of the most vivid and striking saltwater fish anywhere in the world. It’s one of the smaller marine angelfish species available only reaching a maximum length of 10 inches. Even with it’s smaller size in comparison to other angels, the Regal Angelfish needs a very large tank with mature live rock and an ample supply of hiding paces where the fish can retreat. The Regal Angel is one of the most difficult fish to care for in captivity. They are often very difficult to acclimate and to get eating. Water parameters of the Regal Angelfish must be absolutely stable. This includes the following: PH of 8.1-8.4, Nitrites 0 ppm, Nitrates <5ppm, Ammonia 0 ppm, temperature 72-78 degrees Fahrenheit, SG 1.023-1.025. The PH of any aquarium containing this species should not drop below 8.1. 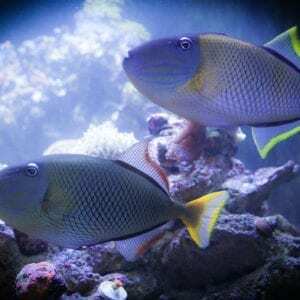 Frequent weekly water changes of 10% rather can chemical additives are necessary to keep this fish healthy. A very finicky eater, the Regal Angelfish will need naturally occurring sponge in the tank to graze on. Most specimens will be reluctant to feed the first few days. Algae sheets have been known to illicit a feeding response as well as live Mysis shrimp, clams and mussels. The majority of their diet should be plant based, however meaty foods can also be given sparingly. In addition to feeding, stress and tank mates are also an important consideration. Regal’s should not be kept with anything that is larger and or faster such as large Wrasses or Triggers. 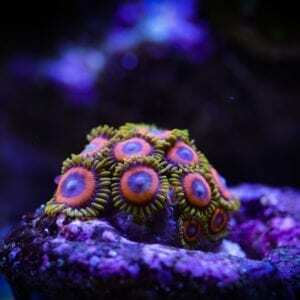 There are obviously exceptions as the Regal Angel thrives best when added first to a reef tank. Once territory has been established and secured, other semi aggressive fish can be introduced with the exception of other angels. Dwarf angels are especially aggressive towards Regal’s. Regal Angelfish can co exist together, but only in the largest of aquariums of 250 gallons or more. Two Regal Angels have a better chance of co existing peacefully if added at the same time and each specimen is a different size. When it comes to the Regal Angelfish bigger is definitely better. The larger the reef system, the better chance of success. Although they may pick at some corals, having a stable flourishing reef system is a must in order for long term health. In the wild, tunicates and sponges represent a large portion of their diet. Typically shy by nature, they do not appreciate intense lighting. Hiding places, drop offs and caves where the angelfish can completely conceal itself are a necessary stress reducer. Overall, the Regal Angel is one of the most mesmerizing saltwater fish in the hobby today. Despite it’s obvious beauty, there are multiple challenges associated with raising a Regal Angelfish. This species of angel is definitely not for the novice, intermediate or even advanced aquarist. 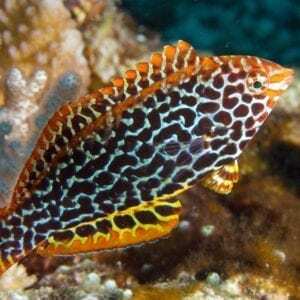 Only the expert aquarist with success in raising other difficult species should attempt in raising what many have called the most attractive fish in the world.